Providing excellent customer support means allowing customers to access that support from any device they choose, whether it’s a computer, phone or tablet. Additionally, the ability for customers to actually see who they are talking to is the next wave of efficient and effective customer support. Using LiveSwitch for chat, signaling and media transmission, support personnel can both chat and video conference with customers using any device. Consumers can access your customer service easily on the go, and video conference with your staff no matter where they are or what they’re doing. LiveSwitch can also be used to pass contextual information to the service rep without them having to ask. Examples of this contextual information could be what’s in a user’s cart on an ecommerce site, or what page of your website a user is on. LiveSwitch further adds screen sharing capabilities allowing the customer service rep to provide more helpful service. Having this information integrates the service rep with the customer’s experience, resulting in faster support that increases customer happiness and sales. 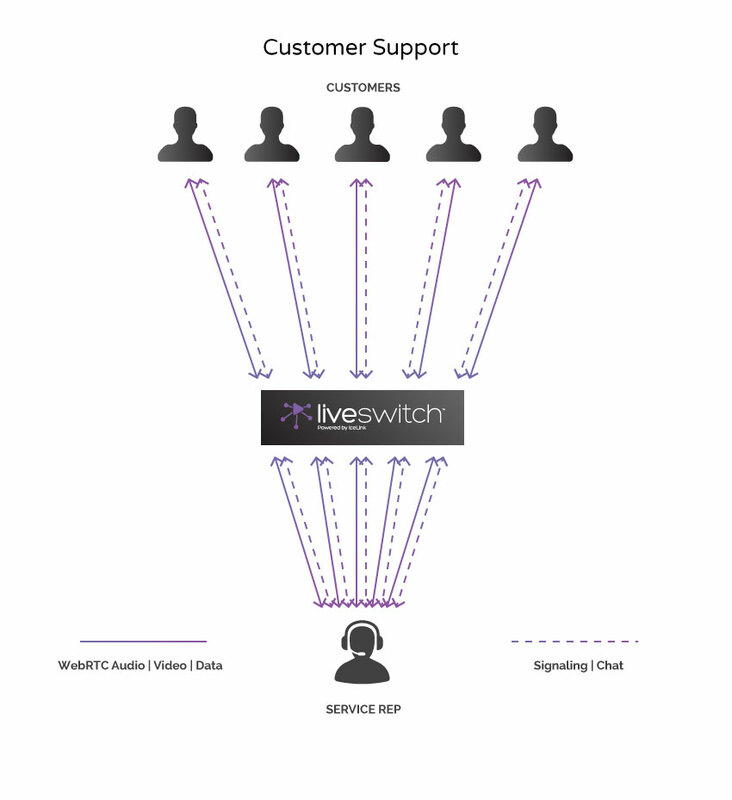 This chart is an example of how LiveSwitch could be used in a customer service application. WebRTC signaling is used to control and monitor conversations, and for text chat if desired. LiveSwitch runs as a peer on each of the clients, while each client peer has a matching peer running on the customer service computer. The clients can be running either web or native applications. The service rep will typically be running on a native platform, such as .NET, to give increased stability and flexibility across browsers when dealing with multiple simultaneous communications. Although not shown, a recording server can also be used to record all or select audio/video or chat conversations if desired. 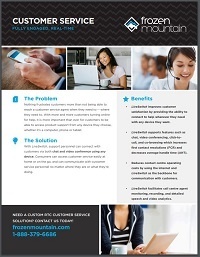 Companies worldwide rely on Frozen Mountain to develop their customer service solutions and products. Contact us to see how you can also use Frozen Mountain's RTC products and services to be at the forefront of customer service delivery.